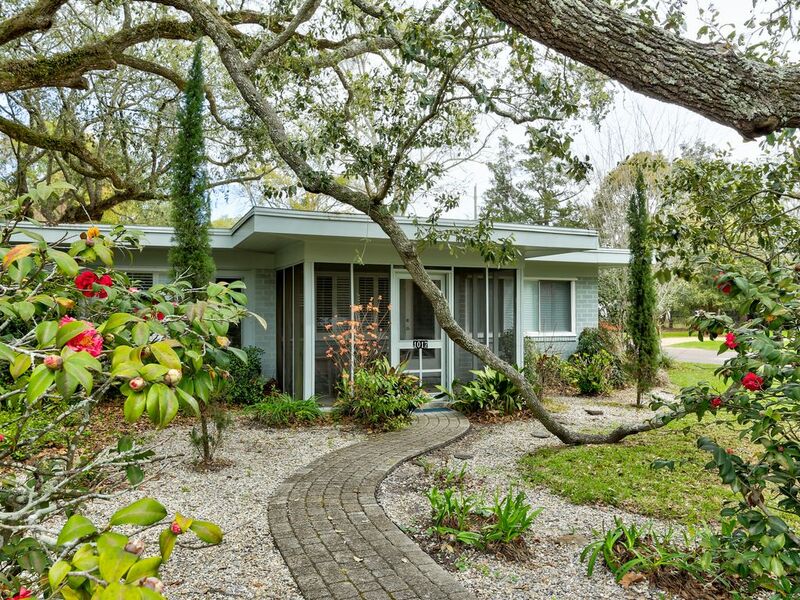 Ideally situated one block to the beach & just down the road from the downtown shopping/restaurant district, Oak Shade Cottages is a meticulously maintained property within easy walking distance to historic downtown Ocean Springs, as well as beautiful Front Beach. Newly renovated, Oak Shade is the perfect place for a romantic weekend getaway, as well as week-long vacations with friends and family. Inside Oak Shade's The King Suite, you will find a firm, yet comfortable king-size bed with luxurious bedding, and bedside lamps with built-in USB phone charges. The full bath includes a marble soaking tub, and plush bathrobes are provided. The King Suite's open floor plan features comfortable seating situated around a large flat-screen SMART TV, and natural lighting overlooking the courtyard. This space is perfect for reading a good book, and you can also enjoy complimentary coffee at the breakfast nook. Other features include a Nest heating/cooling system, key-less electronic keypad entry to cottage, one designated off-street parking space, mini-fridge, microwave, glassware, flatware, plates/bowls, cheese platter with knives, mugs, and Kuerig coffee maker. Oak Shade guests are also welcome to our bicycles and beach chairs at their leisure. Oak Shade Cottages is the perfect place to find comfort, peace, and solace amongst the natural beauty and art-filled community of Ocean Springs. It's one block from the beach! Close to shops and restarants. The suite is tastefully decorated and well appointed. Very Comfortable. Easy parking. Great heating and AC (may seem like an odd thing to comment on but easy to get exact right temp). A little table and chairs have been added to the patio sitting area since earlier reviews. We walked down to look at some other pricier cottages and were glad we stayed here, as we liked the ambiance better. Great experience. Very good location. So close to everything. Thank you for your kind review. We hope you come back and stay with us again! The room was very nice. A bit over priced for what you get in my opinion, but I'd still recommend. Hi Joshua, happy to hear that you enjoyed the room and the nice things you said about it. Sorry you felt it was overpriced, but we feel it is extremely affordable for being so close to Front Beach when there are very limited options to be as close to the water in Ocean Springs as us. Glad that you would still recommend us. Thank you! Happy to hear that you loved it! We hope you come back and stay with us again soon!